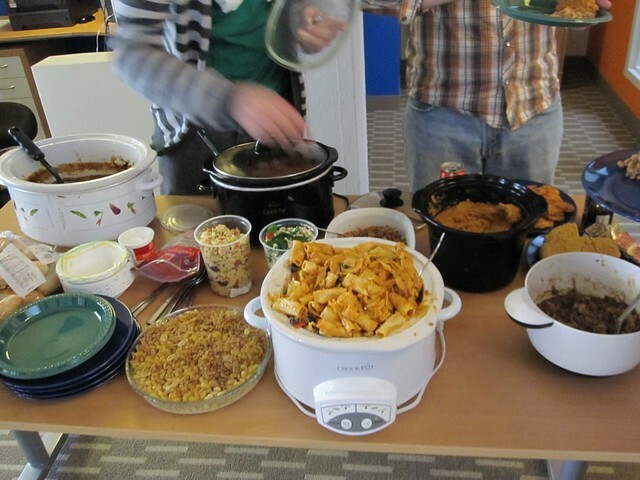 Viget has a tradition of Free Lunch Friday (FLF), where we gather as a whole company to talk, plan, laugh, and eat on Viget's tab. Everyone calls into a conference line and we use TokBox for video. It's a fun, tasty perk of working here. One Friday in December we did something different -- special, even -- at our Durham office and I wanted to write about it. 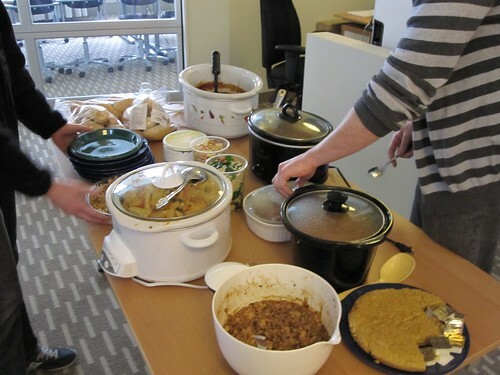 Viget South decided to try replacing FLF with PLF (Potluck Lunch Friday) recently. Each person signed up for a specific type of food (main course, veggie, side, dessert), and everyone brought something to share. 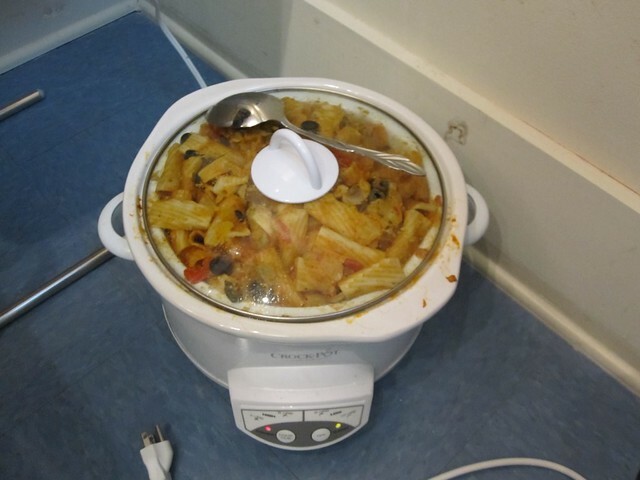 We brought in an extra microwave for reheating, and people showed off their fancy crockpots. We set up a buffet table and had ourselves a feast! Not to pick favorites, but … Mindy's riggies were OUT OF THIS WORLD. The whole point of PLF was to donate the money Viget saved that week to a local charity. 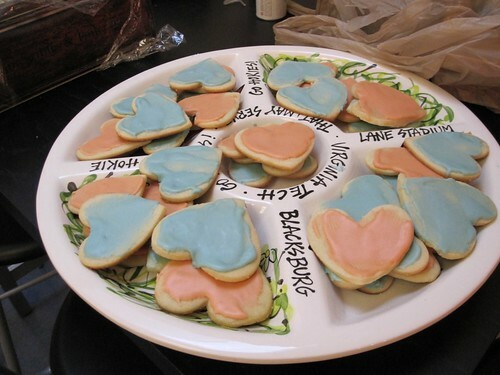 To make it even better, Brian and Andy surprised us and decided to double the amount! Last week, I walked the check over to Deanne at the Urban Ministries of Durham (UMD) -- a homeless shelter, food pantry, and homelessness prevention center just a few blocks away from our office. Deanne is awesome at her job, so instead of this being a one-time donation, she convinced me that there's an opportunity for Viget and UMD to build a lasting relationship. My hope for 2011 is that more of the Viget team will use their community service days (PTO provided by Viget for us to do charitable work) and that UMD will hopefully become an easy, go-to choice for doing so. 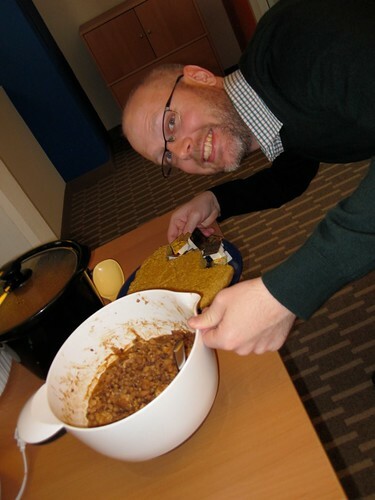 In addition, UMD is happy to facilitate a volunteer opportunity for our whole office later this year. Each quarter we get out of the office and do something as a team. Historically it has been things like paintball or a cooking class, but I think spending a day at UMD will be just as effective a way to strengthen our team. And, who knows, maybe PLF will become a quarterly tradition as well … Anything to get me some more riggies!